When people think of China a plethora of images emerge in their mind -- the Great Wall, Tiananmen Square, Terracotta warriors, and just as inevitably, monks frozen in dramatic postures engaged in deadly combat. 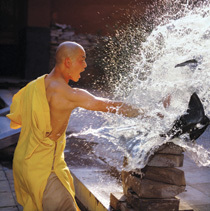 What is Chinese martial arts? Martial arts continues to be in the process of change as it adjusts to new socio-political and cultural circumstances. However, one thing remained constant through these morphous transformations -- its spirit -- which persists as an enduring symbol for Chinese identity. 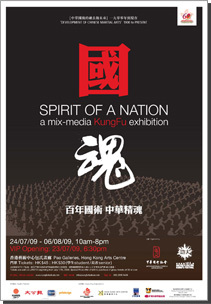 Through a journey spanning over a hundred years, Spirit of a Nation will take the audience from 1900 to the present day, beginning with China's struggle for independence and national identity in the early 20th century, through prolonged wars against foreign occupation, to the creation of a new kung fu genre in Hong Kong cinema, and a gradual reawakening of national culture in the 21st century. We believe the resurrection of Chinese martial arts will lie at the heart of China's cultural regeneration. At the dawn of what some predict will be 'China's century', we announce the rebirth of Chinese martial arts at Spirit of a Nation. Tickets are sold via URBTIX beginning from July 17th to August 6th, 2009. No internet booking or credit card telephone booking services will be available.